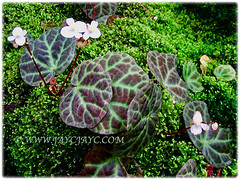 Begonia rajah is an Asian and rhizomatous species with distinctive foliage in dark green and deep mahogany. 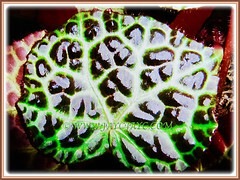 The leaf area between the veins is raised, giving a large bubbly effect. A free-flowering plant with captivating flowers in white and tinged with pale pink, or coloured pink. 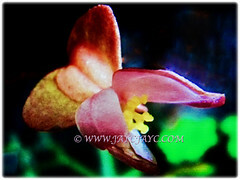 Botanical Name: Begonia rajah (syn. 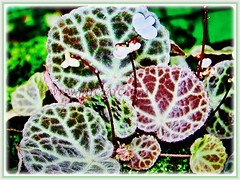 : Begonia peninsulae). Common Name: Resam Batu in Malay. Etymology: The genus name Begonia coined by Charles Plumier, a French patron of botany and honours Michel Begon, a former governor of the French colony of Haiti. 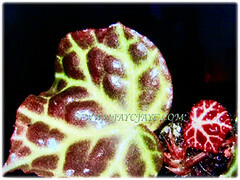 Features: Begonia rajah is from the genus Begonia that consists of about 1795 different plant species. A rhizomatous herb with slender and creeping rhizomes. A compact plant that grows between 15-30 cm in height. Juvenile leaves are almost bright red with pale dull green veins. Evergreen leaves are ovate, base cordate with overlapping blade bases and approximately 10 cm wide at maturity. Leaves peltate and orbicular to shallowly reniform. The colour is a deep mahogany on the upper surface of leaf and indented with distinctive green veins. Under surface of leaves are coloured pale yellowish green to dull green and flushed with red. Leaf margin has a fringe of short hairs. Blossoms with thin texture are white and tinged with pale pink, or coloured pink. 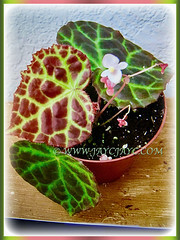 Culture (Care): Begonia rajah grows easily with least maintenance. Light: Semi-shade with preference to bright light or filtered sunlight. Moisture: Moderate water requirements. It doesn’t tolerate wet feet, thus water only when necessary. It requires occasional misting and enjoys high humidity. Soil: Humus enriched, moist, loamy and well-drained soils. Others: Cut of withered leaves to rejuvenate growth, provide good air circulation and keep the plant aesthetically pleasing. This beauty will only look its best when grown in a cool position in low light levels. If receiving too much light or heat the leaves tend to lose their rich color and become olive green. Feed it once monthly with a balanced liquid foliar fertiliser. Mist the foliage occasionally and provide a high humidity environment. Generally free from serious diseases and pests. Nevertheless, watch out for chewing and sucking insects such as caterpillars, mealybugs and thrips. 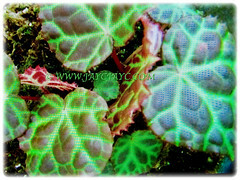 Begonia rajah is frost tender and tolerates temperatures only above at least 1°C. It does not tolerate high temperatures or direct light. Feed and water sparingly during fall and winter. It needs bright light to intensify the leaf colourations and promote good flower development, though not full sun to avoid leaf scorch. A free-flowering plant that produces white to pale pink flowers during summer. 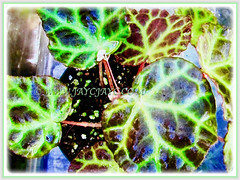 An attractive begonia species with captivating leaves that’s suitable for growing indoors in a pot and does well in an enclosed container such as a terrarium. Besides, the plant stays compact. Propagation: Propagated by seeds, stem cutting or leaf cutting. Freshly harvested seeds will germinate after 8 weeks. 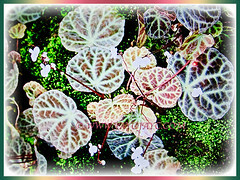 Usage: Begonia rajah is grown for its captivating and ornamental foliage. It’s suited to be planted in a pot or grown in the ground. Excellent as a terrarium plant.